Kim Hye-soo and Yoo Ah-in star in director Choi Kook-hee's new film. Following a promising debut, Split director Choi Kook-hee steps up to the big league with the star-driven period financial thriller Default, a three-strand narrative detailing the calamitous week around Korea's IMF Crisis in 1997, featuring local leading lights Kim Hye-soo and Yoo Ah-in and a big supporting role for French superstar Vincent Cassel. The film borrows heavily from recent global financial thrillers, stirs in a predictable dose of melodrama and attempts to tackle women's equality. In 1997, Korea's exploding economy shows no signs of faltering on the surface, but a pair of people have begun to notice the cracks and they must make their voices heard before the country's financial ruin, but for very different reasons. Han Shi-hyun leads the monetary policy team at the Bank of Korea and expresses her concerns to government superiors. Soon she's in the room with top policymakers to whom she proclaims a devastating forecast: in one week, Korea will default on its mounting debt. At a private investing group, Yoon Jung-hak has also seen the writing on the wall. His response is to quit his job and set up shop on his own, but he must convince his former clients to come over to his side, promising vast riches if they bet against the country, starting with its currency. Meanwhile, Gab-soo runs a small dishware company which has just scored a huge order from a major department store. The deal will make them rich, unless the company they signed with were to suddenly go under. Korea's financial crisis left a permanent mark that still haunts the country today, but despite the IMF Crisis taking place over a decade before the Global Financial Crisis, Default derives many of its narrative tricks from recent financial thrillers from around the world. Choi's film, from a script by Uhm Sung-min, exists somewhere between Adam McKay's The Big Short and Johnnie To's Life Without Principle. Regarding the former, Yoo Ah-in's investor betting against the system is a one-note retread of Christian Bale's heavy metal-loving hedge fund manager, while the intercut, but more or less independent, three stories call to mind the similar but better integrated story structure of To's finance world cautionary tale. Kim Hye-soo is one of the few actresses still trusted with leading big-budget productions in the Korean film industry. A screen veteran of 25 years, she has become a bolder performer in recent years, showing off an ability to dive into very different characters, such as in the gangster drama Coin Locker Girl. Once again, she tackles a completely different character type with Shi-hyun, a role she buries herself into and might be convincing were it not underserved by the weak characterizations in the script. In her first speaking scene, as she meets a superior to impart the bad news, Shi-hyun is presented as a brilliant mind who exhibits some OCD tendencies and somewhat poor social skills. She can immediately recall that she filed her original report 253 hours and 25 minutes ago and proceeds to neatly align crooked documents on her boss' desk. At no point in the rest of the film are these OCD ticks presented again. The late 1990s business and governmental world in the film is very clearly shown to be hostile towards women. 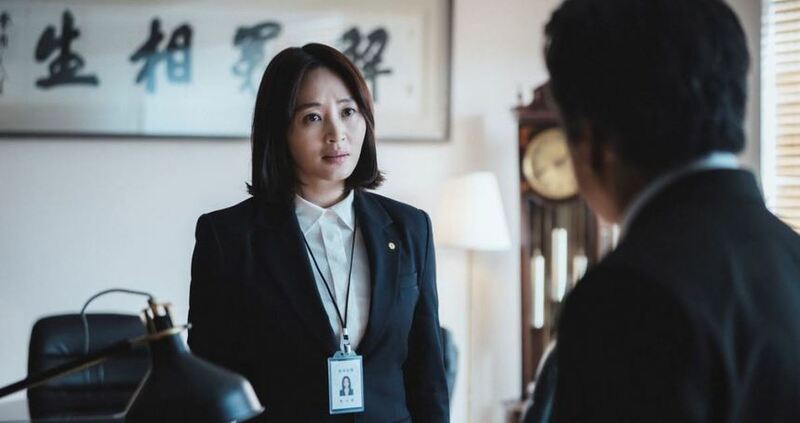 During several meetings, including the big boardroom IMF negotiations later in the film, men openly deride Shi-hyun for her gender, decrying that woman have no place in their midst. Of course, her sympathetic underlings always vocally rush to her defense. Well-intentioned though it is, this social angle of the film lacks a great deal of subtlety. Moreover, the script seems to try to make the proposition of Shi-hyun as a brilliant and highly competent women more palatable to audiences by presenting her as 'gifted'. Following his career-best work in Lee Chang-dong's Burning earlier this year, Yoo is back to playing a fairly typical smarmy character in Default, with shades of his corporate heir villain in Veteran, but there's precious little definition to his character. More successful is Heo Jun-ho, recently seen in Kim Jee-woon's Illang: The Wolf Brigade, as the small business owner. Grizzled and sympathetic, his Gab-soo is the relatable and emotional core of the film, designed to evoke memories of the financial woes from two decades prior for local viewers. Despite these not insignificant issues, Default is for the most part a watchable drama that focuses on a dark moment of recent Korean history, tinged with the anger of a society abused by those in control. To that end the film is effective, even if lacks the gut punch of last year's hits A Taxi Driver and 1987: When the Day Comes. Technically the film is polished, but as it deliberately seeks to evoke a glum atmosphere it comes off as a little drab, without the flair of something like 1987. Also working in the film's favor is its relatively svelte running time, which keeps it under two hours. Michael Moore's a Sicko. Or At Least His Next Film Is.